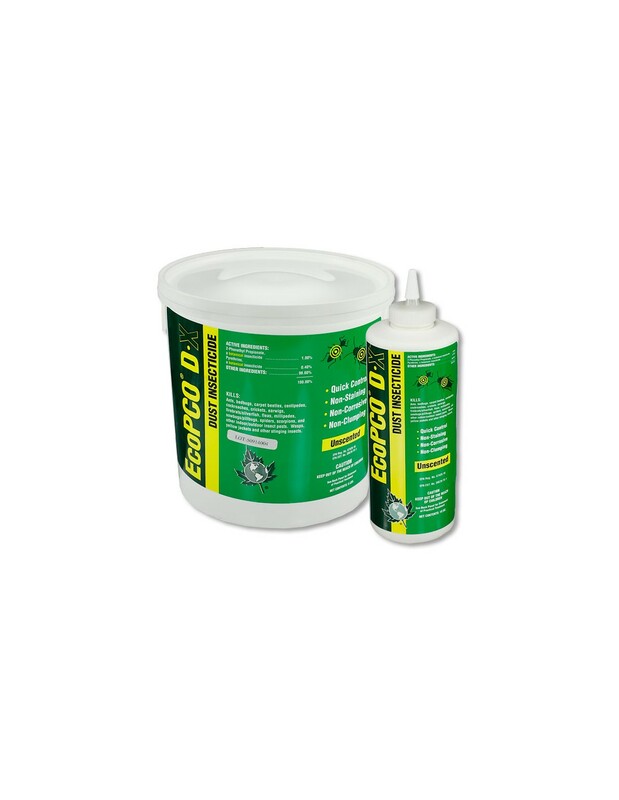 EcoPCO D-X Dust Insecticide is an all-natural organic insecticide dust (plant botanicals) that is versatile and ready-to-use and is perfect for most environmentally friendly atmospheres. Unlike many other organic dusts, EcoPCO D-X Insecticide Dust is unscented, non-staining, non-clumping and water-resistant. It provides a quick knockdown and kill of insect pests and leaves a long lasting residual ! EcoPCO D-X works on a broad label of insects such as ants, bed bugs, carpet beetles, centipedes, fleas, silverfish, scorpions, spiders and more. Can be used both indoors and outdoors. Shake well before using. Crack/Crevice and Void Treatments: Important: Use the injector nozzle tip provided. Interior Treatments: For crawling insects, inject into all crack/crevice and void spaces where insects may be crawling, hiding or living. Release approximately 1 second of product per crack/crevice application and from 2 to 3 seconds per cubic foot of closed void space treated. Apply more liberally for heavy infestations. Applications can be made, but are not limited to, behind baseboards, cabinets, walls, ceilings, door and window frames, and around water pipes and appliances. Ensure contact with as many insects as possible. Repeat as necessary. Grain Weevils, Flour Beetles, Chocolate Moths, Drugstore Beetles, Trogodermas, and Elm leaf Beetles: Inject into cracks and crevices and/or voids where these insects may be harboring, such as but not limited to, cabinets, pantries, wall voids and in machinery. Repeat treatment as necessary. Food Handling Establishments: In food areas, application limited to crack/crevice treatment only. Inject between different elements of construction, between equipment and floor, openings leading to voids and hollow spaces in walls, equipment legs and bases where insects hide. Avoid contact with food, utensils and food preparation equipment. Exterior Perimeter Treatments: For crawling insects, apply to cracks/crevices where insects may enter premises or harbor. Areas to be treated include, but are not limited to, weep holes, under siding, wall voids, soffits, around attic vents, windows, doors and pipes. Treatment of infested fences and tree holes is permitted. STRUCTURAL PESTS: ants, beetles (cadelles, cigarette, confused flour, dermistid, drug-store, granary weevil, hide, larder, leather, lesser grain borer, lesser, merchant grain, mealworm, red flour, rice weevil, sawtoothed grain), boxelder bugs, carpenter bees, centipedes, cockroaches, crickets, earwigs, fire ants, firebrats, fleas, fruit flies, fungus gnats, Indian meal moths, mealworm Mediterranean flour moths, millipedes, phorid flies, pillbugs, scorpions, silverfish, sowbugs, spiders, termites, warehouse moths, wasps and other indoor/outdoor pests. LANDSCAPE PESTS: Aphids, elm leaf beetles, Japanese beetles, lace bugs, leafhoppers, mealybugs, sawfly larvae, thrips, white flies. 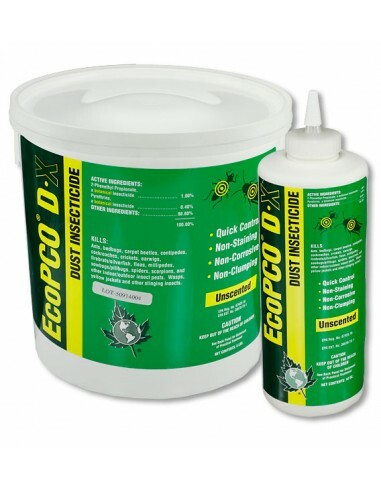 EcoPCO D-X Dust Insecticide Size: 10 oz. EcoPCO D-X Dust Insecticide Manufacturer: EcoSMART Technologies, Inc.